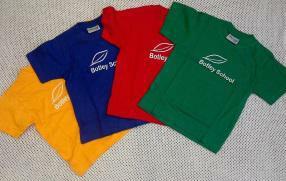 At Botley School all Children from Reception to Year 6 take part in P.E. Each child is placed in a coloured team. either Red, Green, Blue or Yellow. It is expected that children have their P.E. kit in school every day. Children will need: Plimsolls, shorts and a team colour T-shirt for indoor P.E. Jogging bottoms, sweatshirts and trainers for outdoor activities. For safety reasons long hair must be tied back. Jewellery is not allowed to be worn in school but if, for any reason it has to be, it must be removed for P.E. Botley School P.E. T-shirts can be bought from the school office £5 each.